Eric Clough isn't your typical architectural designer. Sure, he'll design you a fine den or kitchen, but he's clearly got a creative streak that goes much deeper than that. 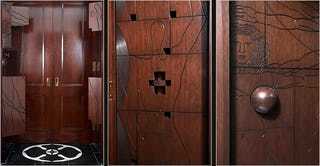 That's why, when given the opportunity, he secretly built an incredible scavenger hunt into a $8.5-million, 4,200-square-foot Park Avenue apartment that included ciphers, riddles, poems and a lot of hidden doors and compartments. In any case, the finale involved, in part, removing decorative door knockers from two hallway panels, which fit together to make a crank, which in turn opened hidden panels in a credenza in the dining room, which displayed multiple keys and keyholes, which, when the correct ones were used, yielded drawers containing acrylic letters and a table-size cloth imprinted with the beginnings of a crossword puzzle, the answers to which led to one of the rectangular panels lining the tiny den, which concealed a chamfered magnetic cube, which could be used to open the 24 remaining panels, revealing, in large type, the poem written by Mr. Klinsky. How amazing is that? It took the family months to discover the scavenger hunt and weeks after that to figure it all out. It's like the live in a children's book of some kind. Unfortunately, magical things like this really are only possible when you're loaded enough to buy an $8.5-million apartment and then give someone another $1.26 million to renovate it without much oversight. But hey, maybe if you're nice to the guys installing your new fridge they'll leave a post-it note with a poem stuck behind it as a secret prize for when you move. Not quite as magical, but I'm trying to work within your means here.